A pregnant woman was punched to her stomach and head in a vicious street robbery. Detectives are appealing for witnesses after the woman was approached by a couple demanding cash. The suspects, who spoke with a local accent, approached the victim while she was walking home in New Brancepeth, Durham, last night. A struggle between the victim and the suspects ensued, before the pair pinned the victim up against the wall and punched her multiple times to her stomach and head. They then made off after discovering the victim’s purse did not contain any money. The incident occurred in Prospect Terrace at around 8.40pm last night. It is believed the victim was followed after she got off the bus at New Brancepeth Club. 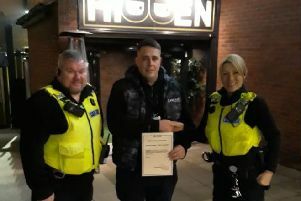 Detective Sergeant Mark Garfoot, from Durham City CID said: "This was a traumatic incident for the woman and we would like to ask the public to help us catch the people responsible." The victim who was taken to University Hospital of North Durham has now been discharged.